PONTE VEDRA BEACH, Fla. — No wife on Tour has better hair than Tabitha Furyk, Jim’s better half. 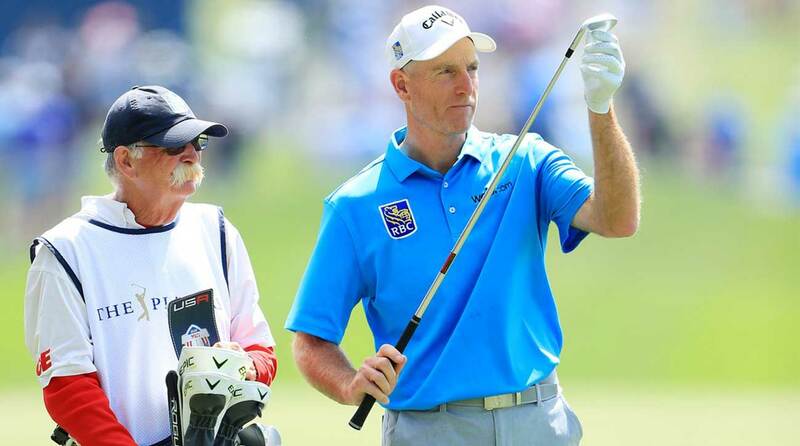 No looper has a better mustache than Mike Cowan, Jim’s longtime caddie. And no player has more grit than Jim Furyk his own self. It was Furyk’s grit that drew Tiger to him when Woods turned pro in 1996. It was Furyk’s grit that allowed him to shoot, at age 48, 15 under par over four days on the Stadium Course here, a score bettered by only one player, and only by one shot. Jim Furyk did not lose to Rory McIlory. He finished solo second. He finished solo second and earned $1.35 million. He slept at home (the Furyks live right here) and played a backyard course, he has said too often for his own liking, he does not particularly like. He practices here but plays his home golf down the street, at Pablo Creek, where Tim Finchem and Jay Monahan and other Tour bigs hang their caps. Furyk, last year’s Ryder Cup captain, is a Tour big himself, a former member of the Tour policy board and the winner of $70 million in career earnings. Your top-four on the all-time list, in order: Tiger, Phil, Vijay, Furyk. That’s an all-world foursome of grit. Phil does all his stretching off-camera and his marathon range sessions at home, though he does do that crazy kick-thing in one of his ads. He’s 48, too. He and Furyk have been matching cards forever, which is amazing, given the Walmart parking lots that often separate their drives. Jim Furyk and "Fluff" look over a shot on Sunday at the Players Championship. Furyk doesn’t do crazy. He’s the least eccentric of men and whether you like that about him or not he does not care. That’s what made him a good Ryder Cup captain, even though his team got beat handily. He was a good captain because he put the players first and did not care if the PGA of America or the fans or the commentators, paid or otherwise, or anybody else liked or did not like his roster picks, pairings or wardrobe choices. The timing of the thing, requiring an overnight Atlanta to Paris flight before the first practice day, was out of his hands. He’s about as sentimental as Whistler’s Mother, now on display at the Louvre, the one in Abu Dhabi, not Paris. The passing resemblance is not a complete coincidence. Furyk is a high priest of here-and-now. Also, do-the-work. It’s not complicated. As it happens, there was about an hour stretch on Sunday, where here-and-now was showing Furyk her fangs. He doubled-down on the only thing available to him: do-the-work. The whole week could have unraveled on the fifth, sixth, seventh and eighth. You could sit in an interview room for a year and not hear that level of candor, unless they were trotting out Rory McIlroy and Jordan Spieth day after day. And the reconstituted Brooks Koepka. Fluff and Jim have their own language out there. No one knows what Fluff is saying, because it all gets mumbled in the mustache. “Just f—ing perfect, it’s turning and rolling, foot from the hole it straightens out and if anything wiggles right,” the 71-year-old caddie said. “He’d hit the same putt again.” Reason being, golf is just really truly a weird and unpredictable sport and that exact same putt will not necessarily do the same thing the next time. Then, 18. The grassy mounds on the right side of 18, up by the green, are heinous, but the tee shot, with the tents on the right and the lake, is difficult under any conditions but was especially difficult on Sunday, with the wind blowing in. Furyk, with that looping move that does not change, drew one down the middle that finished on the left side of the fairway, by far the best place to go at the left hole position. He hit a hard 7-iron and walked right down the line by way of follow-through, almost like Gary Player. His kick-in birdie 3 there made him the leader in the clubhouse. Fifteen under par. “I was trying to make sure I got through the ball real well,” Furyk said. “Also, I think the excitement of it. I hit it, loved the way it felt and looked up and saw it right online. I think I was just really excited to be in the moment.” He loves being a professional athlete. You can tell. On Tuesday, he and Fluff had a long session on the back of the range, Furyk wearing shorts, wiggling his skinny ankles in a practice bunker on shot after shot after shot, Fluff watching, rake in hand. “He’s pretty amazing. He doesn’t change much out there. I’ve always said this: He loves what he does for a living, he likes coming to work and he never changes, whether I’m shooting 80 or shooting 65. You can’t ask for any more than that. I was so jacked up on 17, I actually got a yardage from the wrong head.” Fluff had it. Tabitha had the kids, a son and a daughter, when her husband got in. They huddled and then Furyk watched. He watched McIlroy play 18 on a mega screen, with all sorts of people around, standing straight up, his heels making contact, his toes pointing out, not moving an inch for some long moments, even after McIlroy holed out. One of Furyk’s heroes, Arnold Palmer, was just the same way, never one to waste a step. McIlroy came by, on his way to the scorer’s room and Furyk offered him a manly done-well handshake. Well, it was. McIlroy came home in 33, too, when 34 would have meant a playoff. On Monday, Fluff and Dahmen’s caddie, Geno Bonnalie, are playing in a caddie tournament at Innisbrook, near Tampa, where the Valspar will be played, starting on Thursday. As it happens, they’re paired together. Geno is scratch and Fluff was, but that was a long time ago. Geno is one of those out-of-the-gym modern caddies. Fluff, decidedly, is not. But if this Players showed us anything, it’s this: tried-and-true has legs.